It has been yet another busy month for Microsoft as it updates Office 365 to include real-time chat integration into Office 365 web experiences, as well as new capabilities in mobile devices as well as AutoCAD file compatibility for Visio. 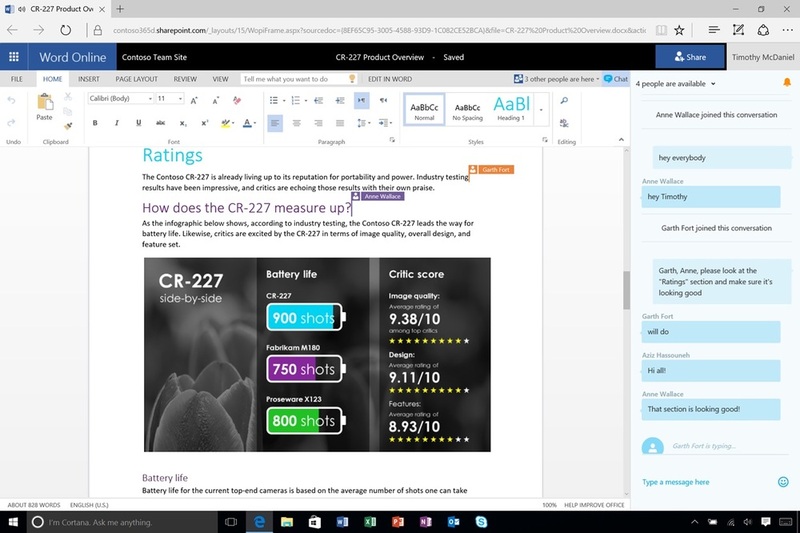 Chat in real-time while you collaborate in Office Online documents stored in the cloud. Visio can help you add smart shapes and data visualization on top of AutoCAD floor plans. You can collaborate on documents more easily in Outlook by emailing a link to a file stored in OneDrive for Business, keeping all the recipients on the same page with the latest version. According to Microsoft in next week’s update, you’ll also be able to quickly join Skype Meetings in one tap from Outlook’s event details view. Outlook on iOS and Android devices now lets you insert links to OneDrive for Business files in email (left), and in next week’s update, join Skype Meetings in one click (right). Earlier this month, Microsoft unveiled its new cloud-first, mobile-first vision and roadmap for SharePoint. We’ve already started to see some of those improvements appear with Office 365 customers to help them empower people and teams to intelligently discover, share and collaborate on content from anywhere and on any device. It’s simpler and more powerful to share files and collaborate from any device. Now you can use OneDrive for iPhone and iPad to seamlessly share, edit and take offline any files stored in SharePoint document libraries, Office 365 groups and OneDrive for Business. On the web, you can copy files from OneDrive for Business to a SharePoint team site or Office 365 group. The new Discover view in both the web and OneDrive for Android helps files find you, minimizing search time with recommendations powered by the Office Graph. OneDrive improvements make file sharing and collaboration simpler and more powerful on any device.